There is a whole lot happening in the Old North End than most Burlingtonians know of, and Hot Yoga Burlington is one of them. Tucked inside the cooperative North End Studios, this two-studio yoga space is owned and operated by North Ender, Bill O’Connor. He has spent the past three months renovating his space to incorporate a technology new to Vermont – Far Infrared. We stopped by to see the revamped studios and take a 60-minute class. We are pleased to present three reasons why we’re loving Hot Yoga Burlington. 1. Far Infrared – for those times when the sun doesn’t shine. For the past three months, the studios have gone extensive renovations to incorporate Far infrared technology. This is big in Europe and the West Coast, and Bill has brought it to Vermont. 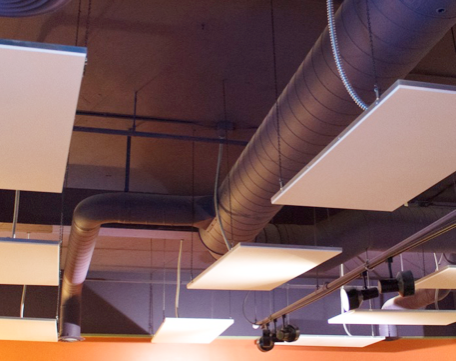 Fourteen panels line the ceiling to radiate a specific wavelength of light that works to heat objects in the room, not the air. It is efficient and non-drying to skin. This means warming energy while your move through your vinyasas, helping to heat up your joints and prepare your muscles for a good stretch. Even better news – studies are showing it helps to reduce skin pore size and treat acne. It’s like yoga and a spa in one! The panels – they might not catch your eye, but you’ll feel what they’re doing! 2. Real people, real movements. 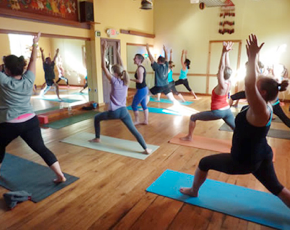 There are some yoga classes that embrace a competitive vibe – Hot Yoga Burlington does not have these kinds of classes. Everyone is there to do their body some good and isn’t worried about the frills. Classes are some of the most affordable in the area, a ten-class pass costing a generous $95.00. Bill never wants the price of yoga classes to be an excluding factor for participants.